My first basket was last week. It came with Spring produce - 4 varieties of lettuce, 2 garlic scapes (yes, just 2!! ), 1 stalk of rhubarb (another story there, for later!! ), a few radishes and tiny bunch of sage... Not impressive, I must admit but I am hoping for a fuller Summer! 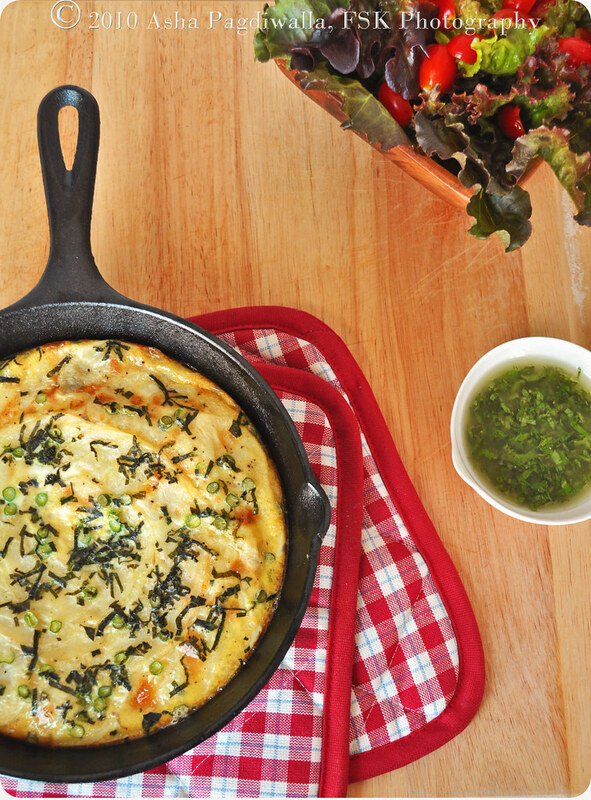 Besides, I have wanted to make this Frittata for the longest time. You'll laugh when I say the inspiration was an in-flight meal but, it is true! I was served a layered potato frittata for breakfast on my flight to Australia (Quantas) and it just hit the spot. So for brunch, I served this lovely layered potato frittata flavored with garlic scape and mint with a light salad of variety lettuce, grape tomatoes in a light, fruity mint vinaigrette! 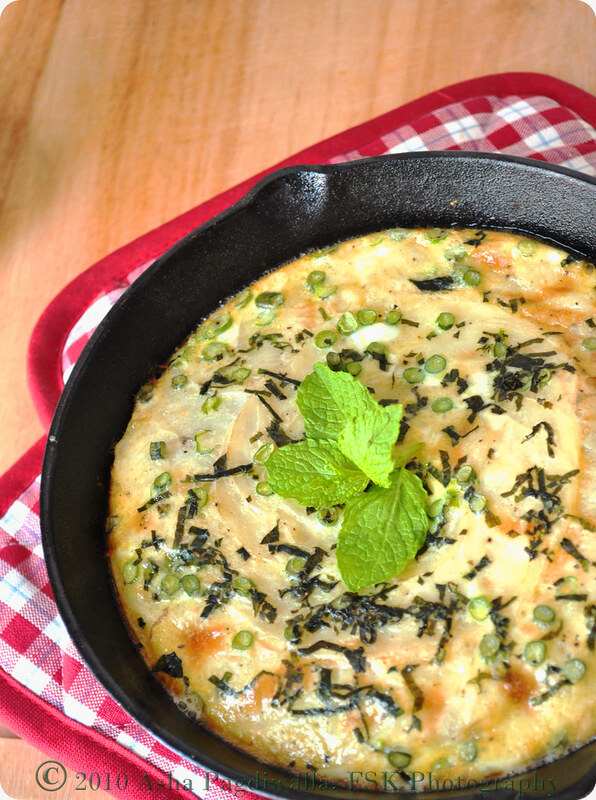 Verdict: I loved the frittata although the mint flavor was not particularly strong in it. We needed the vinaigrette to bring in the taste. As to the scapes, they were fantastic; a subtle garlic flavor blending in so beautifully with the rest of the dish! Preheat oven to 375 F. Grease the bottom of a 8 inch oven proof pan with a butter. 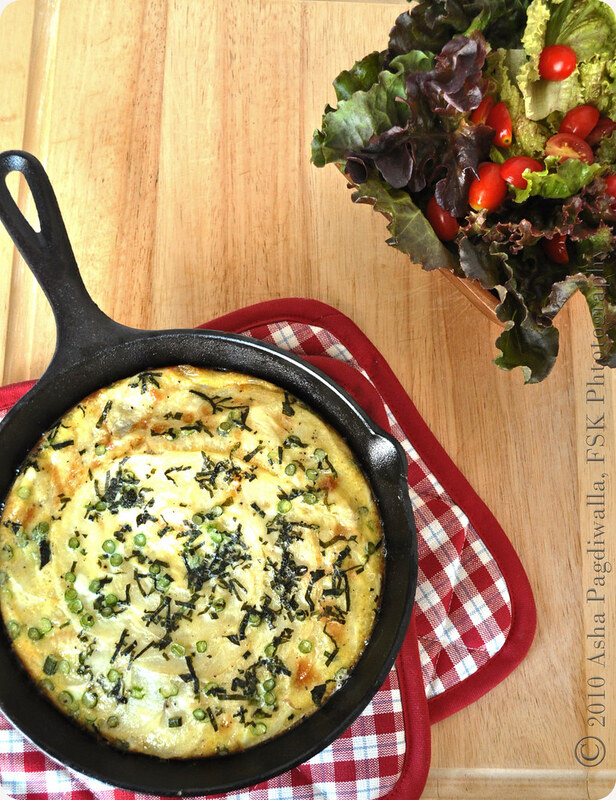 Whisk together the eggs, cream, salt, pepper, butter and garlic scape slices. Arrange one layer of overlapping slices of potato at the bottom and season with salt. 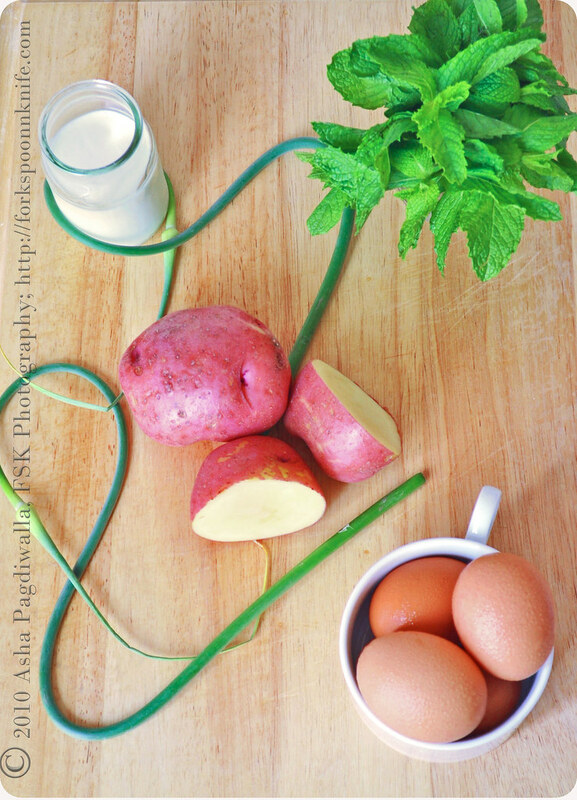 Pour 1/3 of the egg mixture evenly over the potatoes. Sprinkle some mint over them. Repeat to make two more layers ending with the egg layer. Cover the pan with foil and bake for 25 minutes. At the end of it, the egg should have just cooked on top. Move the pan to the top rack and continue baking for another 5 or so minutes until the top is just golden. Velveteers was started by Aparna, Asha, Alessio and Pam, who are passionate about different cuisines and food in general. Each month, we will attempt a new dish and share our experiences and the recipes we used. If you’re interested in joining the Velveteers, please feel free to drop by our food blogs and leave a comment and drop me a line at asha@forkspoonnknife.com.